Stay determined and persistent with this screen-printed lightweight scarf. "Leaving behind nights of terror and fear / I rise / Into a daybreak that's wondrously clear / I rise." It's hard to speak for Maya Angelou, so artist Tori Tissell lets her speak for herself. And the words? They'll give you goosebumps. 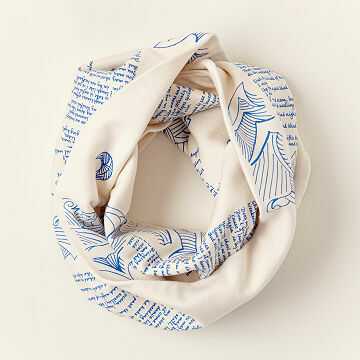 This empowering scarf is screen-printed by hand with the renowned poet's entire poem, "Still I Rise." Within its soft, lightweight cloth is the determination and persistence of all people who have been undermined, disenfranchised, and denied equality. It makes a subtly inspiring, wearable statement for activist friends or the person who inspires you to get up each day and march on. Handmade in Portland, Oregon. Beautiful, warm, cozy scarf! I love wearing my new scarf and love the poem written on it. I wish it was made of a little thinner material. Empowered women empower women! What a powerful gift! The recipient told me it was too nice to wear- but she has worn it a few times and received countless compliments. The gifts, like this one, offered on Uncommon Goods help me give meaningful gifts to even the toughest to shop for-those that seem to have everything! The idea was great but the material not so much. It's somewhat similar to a sweatshirt material without the soft side. It's just not a good material for a scarf. I ended up not giving it to my DIL. The scarf is incredibly warm and cozy. The color is also beautiful and will go with many different outfit colors. I would buy this product again without hesitation. If Only Every Gift Could Be This Perfect! The product was a gift to my daughter-in-law in Chico, CA. She loved it. yes - would buy those i love great happiness in buying this. I wish ALL mother's (in my case), could see that beautiful smile on my daughter's face when she opened her gift. Maya Angelou's writings will forever be praised and passed on to others through Lisa's loving and caring knowledge of Maya. I wish I could send you a picture of my daughter holding this scarf up for others to 'read'. No greater words other than THANK YOU, for bringing such happiness to others. I love how unique this gift was! Young Lady danced in the mirror and around the house when she received it. Took it on a trip with her to New York.